"The Ultimate Halloween Trivia Book, 2nd edition" is the ultimate horror trivia book for the ultimate horror fans. 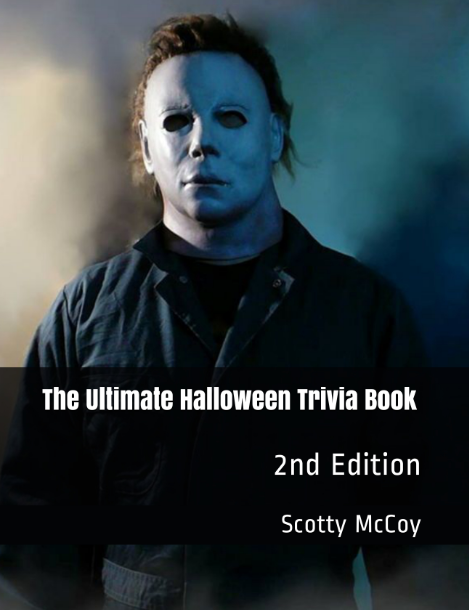 This updated version (2nd edition) of the original "The Ultimate Halloween Trivia Book" has included multiple new content, including a brand new chapter (the 11th chapter) on the 2018 Halloween film, as well as an addition of a word search to the Halloween Mashup chapter, which is now the 12th chapter.It has been updated to 12 chapters and 1300 trivia questions, tying the author of this book's other book, "The Ultimate Friday the 13th Trivia Book" with the most trivia questions in any horror genre trivia book ever created. The first 11 chapters are 100 multiple choice questions, with each chapter on each of the films. The 12th chapter is a 200 question bonus chapter with an updated 11 different parts. The first 10 parts have stayed the same, with an addition of the 11th part being a Halloween-related word search for anybody, fan or not of the franchise, to complete and have fun doing. The original foreword from Jamie Lee Curtis that was written for and inserted into the original 1st edition of "The Ultimate Halloween Trivia Book" is unchanged and still included in the 2nd edition of the book where she gives her amazing insights and experiences on the cast and crew of the original Halloween film, as well as what it was like filming the movie and working on set for her first ever film production.Do you think you are the ultimate fan of the Halloween franchise? Have you paid attention on the new film that was released on October 19, 2018? If you want to find out, then this book is for you. So, purchase your copy and find out how big of a fan you actually are of the Halloween franchise!